Having everyone together for a celebration? Then it’s time for cake! 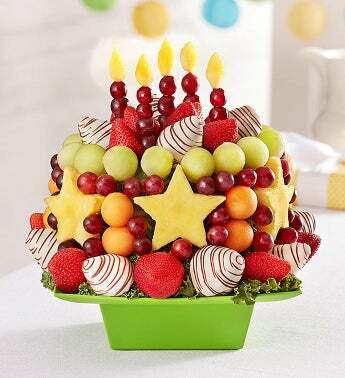 But here’s the delicious twist: Our sweet, unique “cake” is 100% handcrafted from mouthwatering pineapple, honeydew, cantaloupe, strawberries and more, topped with grape-skewer “candles” with pineapple “flames”! And if your celebration is a birthday party, add on a “Happy Birthday” balloon.